Ravnica Allegiance has barely hit the stores, but I would say it’s already a hit. I didn’t do well at my first Prerelease but still had a lot of fun even though I went 0-2 with Simic splashing white. I ran it back again the next day because I still thought Simic was powerful and went 4-0 splashing white again. Mark Rosewater posted on Twitter asking for some cool stories. I replied, “Got a chance to chat with a friend I haven’t seen in a while about projects and software development.” That’s Magic. Aside from that, the cards just seemed really cool to see and play with. And we’ve already seen some development with some of the new cards. Anyhow, you’re probably here to read about some new info on cards. So let’s get right into it since there are some pretty interesting picks this week. This card has been popping up a lot more in Modern’s Mono-Red Phoenix. But it also sees quite a bit of play outside of that deck, in Modern as well as Legacy. I think this deck should run Snow-Covered Mountains to throw some people off by making them think you might be playing Skred Red in the first few turns. I’ve already talked about Snow-Covered lands in article #9. Another card to look at here is Soul-Scar Mage. I know Christopher Martin has been pretty high on this the past few months, since it just rotated out of Standard not too long ago. Feel free to hit him (@Chris Martin#5133) or me (edward.eng#4978) up in the Discord channel for further details. There aren’t any decks really using this and it doesn’t see that much play in EDH/Commander. But I picked this up just for fun because it was cheap, and 7th Edition foils are pretty hard to come by. All the other playables are very expensive. If Wizards ever reprints this as a common, it could skyrocket if it sees play in Pauper. For more on old foils, check out Sigmund Ausfresser’s article. 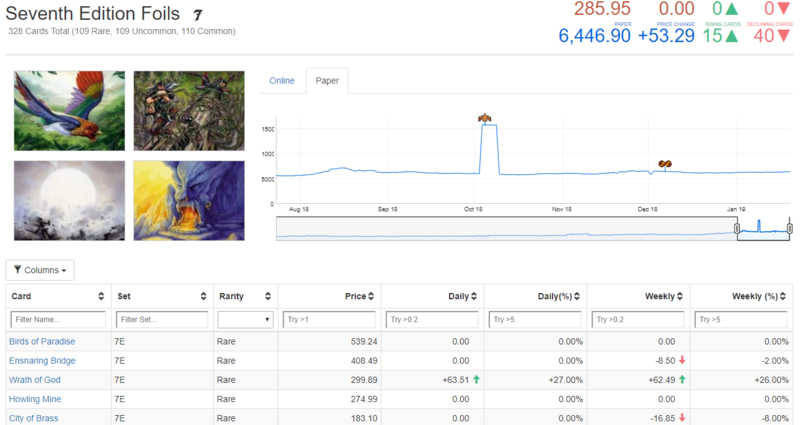 For the full list of 7th Edition foil prices click here. This might be one of the more used split cards from Ravnica Allegiance. 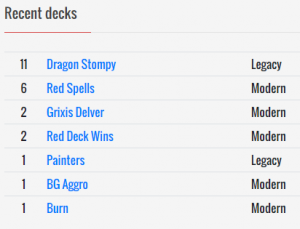 If you haven’t seen Paulo Vitor Damo da Rosa’s article that ranks all ten split cards, I suggest you check it out here. I’ve already talked about Depose // Deploy in article #28 and Incubation // Incongruity in article #26, which both came out before PVDDR’s article. 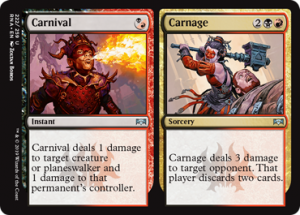 However, he convinced me to pick up a playset of Carnival // Carnage after reading his article. I don’t know if it’ll make the cut in non-Standard compared to Depose // Deploy or Incubation // Incongruity. 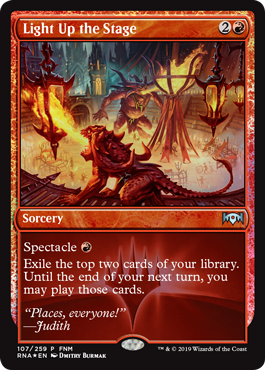 But it’ll definitely see play in Standard since it does a good job of enabling spectacle for only one mana. I was tipped off to this by James Chillcott. I’ve been thinking about getting these for a while since they already see a decent amount of play in Pauper. But now the card is showing up in an already established deck in Modern, which was the tipping point for me to pick up a couple of cheap playsets. This is another card from the list above that was cheap, so I also picked up a playset. There are a lot of other cards to talk about from that list, namely Elder Deep-Fiend, Eldrazi Skyspawner, Underground River, and Distended Mindbender. Elder Deep-Fiend is cheap foil rare that saw play in Standard, almost always as a four-of. They work well in multiples and, as you can see, the list above runs four too. Eldrazi Skyspawner saw a lot of play in Modern when Bant Eldrazi was good. 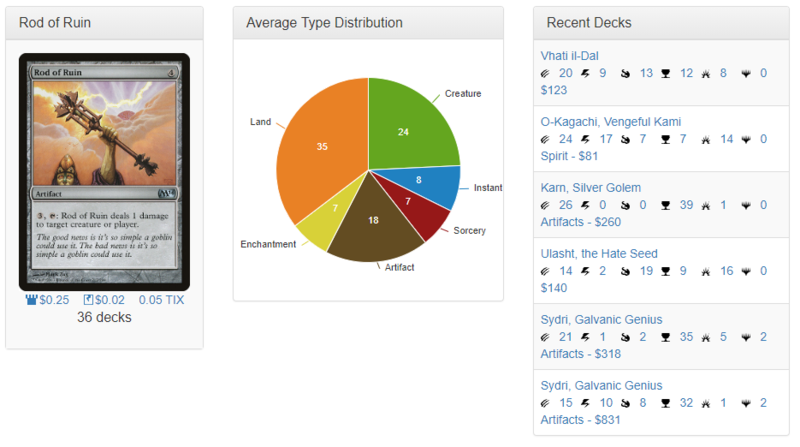 It still sees occasional play in Legacy now. Underground River is similar to Adarkar Wastes that I mentioned in article #25. And Distended Mindbender is another card that’s similar to Elder Deep-Fiend which also benefits from playing them in multiples. 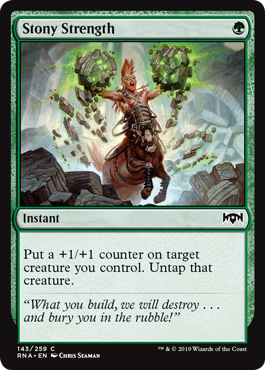 Plus, the emerge mechanic seems a bit more difficult to reprints. Also, don’t forget about Serum Power which I mentioned in article #18. I don’t know if this will ever see play in Pauper or Modern, but I wouldn’t dismiss it. A 3/2 hybrid creature with two abilities is pretty nice. It’s also a Human. This also plays well with the devotion mechanic if that ever comes back. Anyways, like Rod of Ruin mentioned above, this was mostly just a “fun” purchase. A friend of mine has already said this card is pretty powerful in Standard. And I’ve seen a lot of people on Twitter talking about testing it. Red seems to be pretty powerful in Standard again owing to cards like Judith, the Scourge Diva and Skewer the Critics. People have been trying it in Modern too. I’m not so sure if it’s good enough for Modern yet, but we’ll see. 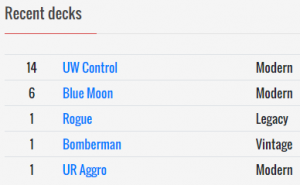 This definitely puts cards like Gut Shot into the spotlight more, which already sees a lot more play in Modern thanks to all the Arclight Phoenix builds. This one is a bit interesting. Dylan Krause posted in the Magic for Good Facebook channel with his 5-0 take on another new Arclight Phoenix deck. These were pretty cheap, so I decided to pick them up in case this type of Phoenix deck takes off. This is also the only version with this artwork. This is another interesting one but might be a little more tangible since a lot of people are talking about Electrodominance, including Gabriel Nassif. He’s been trying to break Izzet Living End in Modern. He got a trophy on Magic Online with the deck. 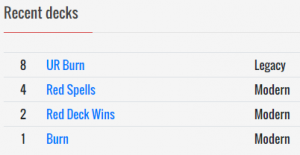 But then he went 0-3 in a Modern Challenge, so we’re not sure if the deck is really any good yet. So this is just another ‘fun’ buy. But it’s the only foil version with the original artwork. And you can play it in Premodern. This is another card in Gabriel Nassif’s list. One-mana cyclers like Desert Cerodon, Striped Riverwinder, and Deadshot Minotaur are critical to making a Living End deck function properly. Most of the blue versions will play four Curators as it’s one of the stronger ones available. Here’s your list of cycling creatures in Modern. Striped Riverwinder also sees play in Pauper. This is another four-of in Gabriel Nassif’s list. This one sees a lot more play in other Modern decks, compared to the other cards mentioned above. I think we’ve pretty much hit the floor on this version, so now is probably a good time to pick them up if you need them. We saw this spike to $10 at one point about three years ago. Although it’s about half that price now, it still shows up in a quite a few lists. I don’t think this promo will ever dip back down to the low of around $2-3. This is starting to see a lot more play in Phoenix decks in Modern as a one-mana answer to cards like Thing in the Ice. While Lightning Bolt might be the best all-around card in Modern, four-toughness creatures are where it’s at now in the format because Bolt is so ubiquitous. I mentioned this card in article #28. I’m still not sure if it’s really good or bad. 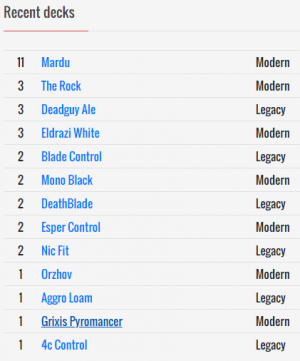 However, I did come across this list in a Competitive Legacy Constructed League posted on January 19. I also mentioned this card in article #28. 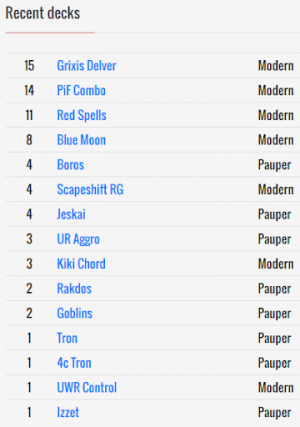 A friend of mine and SCG Open Champion, Collin Rountree, showed me this 5-0 list. I still think Incubation Druid is pretty busted, but you have to find efficient ways to turn it into a Black Lotus every turn other than via the adapt mechanic. One of those ways is Stony Strength. 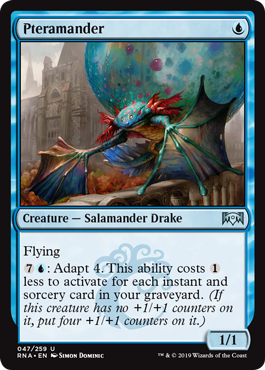 You can use it on your other adapt creatures like Growth-Chamber Guardian, beef up your Marwyn, the Nurturer for extra mana, or protect your Steel Leaf Champion from a Lava Coil. It’s also just a decent combat trick.